WASHINGTON (CNN) -- At least 74 schools have closed across the country because of confirmed or probable cases of swine flu and 30 more have closed as a precautionary measure, the Department of Education said Wednesday. 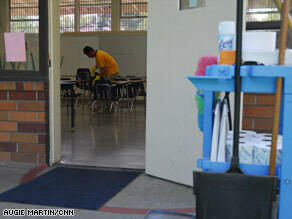 John Garcia disinfects a classroom at St. Mel Catholic School in Fair Oaks, California. The elementary, junior high and high schools have closed because of the H1N1 virus, Department of Education spokesman Massie Ritsch said. The closures of public and private schools across eight states affect about 56,000 students out of an estimated 55 million students attending the nation's 100,000 kindergarten through 12th grade schools, Ritsch said. Some of the schools that were closed had already reopened, he said. In addition to closures announced earlier Wednesday, the Fort Worth Independent School District in Texas said it will temporarily close all of its schools until further notice, affecting roughly 80,000 students, according to its Web site. Schools will likely not reopen any sooner than Monday, May 11, the district said. School officials said they made the decision after receiving official confirmation of one case of swine flu at one campus and news of three other probable cases at three more schools. "We have been diligently following the recommendations of our local public health authorities since this crisis first began," Superintendent Melody Johnson said. "We will continue to work with the senior-most staff of the local health department." The Madison County, Alabama, Schools district, which includes Huntsville, will also close its schools Thursday and Friday due to two probable cases at an elementary school. On Wednesday, President Obama called on schools with confirmed or possible swine flu cases to "strongly consider temporarily closing so that we can be as safe as possible." Education Secretary Arne Duncan said Wednesday that everyone involved in schools needs to "pitch in and do our part to prevent the spread of this flu virus." "Use the same common sense and courtesy that you would use during winter flu season: Wash your hands, cover your mouth when you cough and stay home if you are sick," Duncan said. The secretary said the department is closely monitoring the flu outbreak and urged schools to follow guidance from the Centers for Disease Control and Prevention. "Do what is appropriate for the health of your communities, your schools and your students," Duncan said. Department of Education officials and experts from the CDC held a conference call Monday with more than 1,700 people from national education associations, state school offices, individual schools and school districts. The Department of Education emphasized the need for "common sense" preventative measures among students and faculty in school facilities, an official said. Education officials also stressed the need for people showing any flu-like symptoms to stay away from school and called on administrators to report any suspected or confirmed cases to local public health authorities as well as the Department of Education. If a school has a confirmed case of swine flu, the CDC recommends closing the facility for about seven days.